A BLANK space at New Norfolk Primary School was turned into a welcoming wall under Arts Tasmania's public art program. 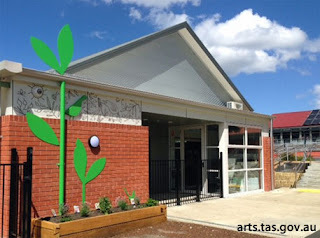 A recent issue of the Public Arts Newsletter featured the completed Beanstalk work by Alex Miles, which transformed the front wall of the school's new Kindergarten building. The newest classroom at the school was redeveloped early last year to provide a home for the school's Kindergarten following the closure of the Blair St campus. Beanstalk is one of the first things seen by students and families visiting the new building. "It plays with the idea of growth, nurture and imagination with the design appropriating an existing downpipe and turning it into the stem of a beanstalk," the newsletter said. "The top leaves sprout out and above the roofline suggesting onward growth beyond the early years rooms." "A friendly bird and grasshopper perch on the wall while a garden bed in front of the wall provides a place for young gardeners to plant their own beans and explore nature. Incorporated on the cladding above the wall Alex reproduced images from students in a monochrome paint."